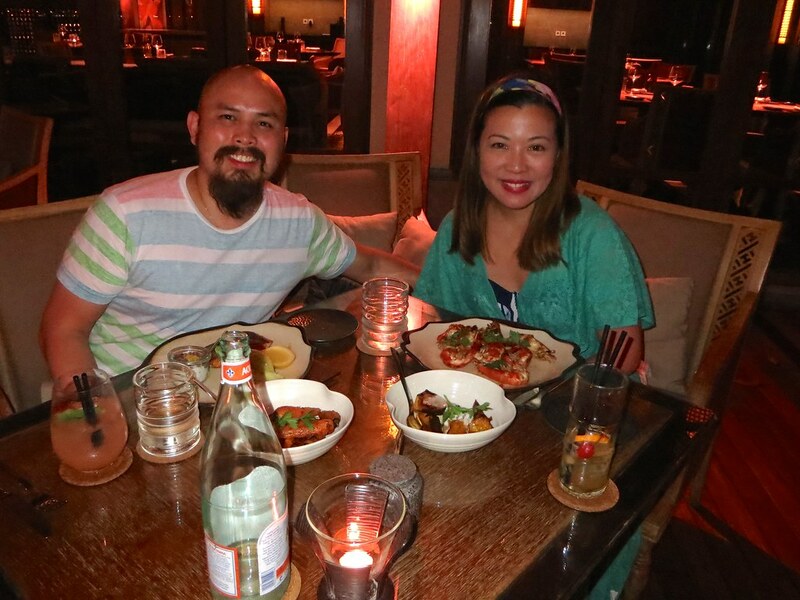 My Birthday Dinner at Sundara Restaurant in Four Seasons Resort Bali. 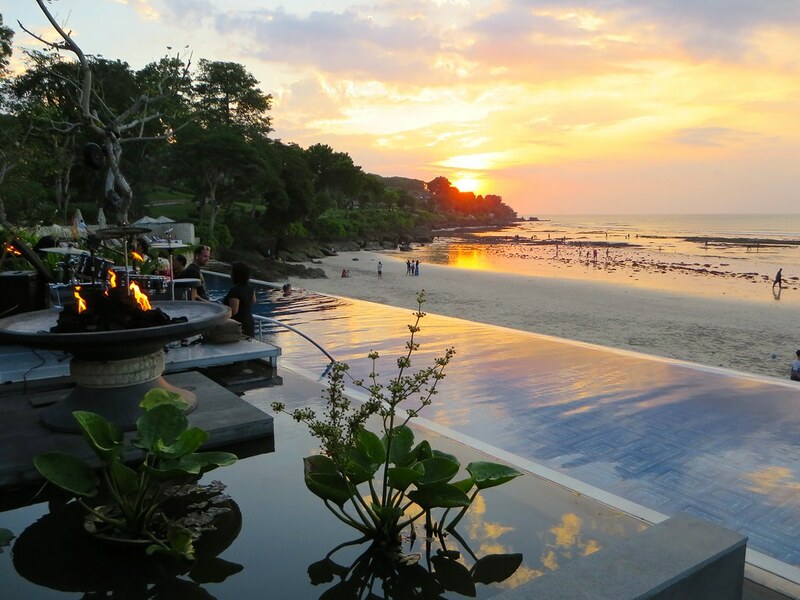 For our last dinner in Bali, my plan is to have seafood ala dampa style and watch the sun set in Jimbaran Bay. I have no particular restaurant in mind so T and I walk along the shore to look for one. Finally, I decide on this casual restaurant that has good reviews on the internet but T said that since we won't be spending my birthday together, he'd rather that we celebrate it at a posh restaurant that evening. 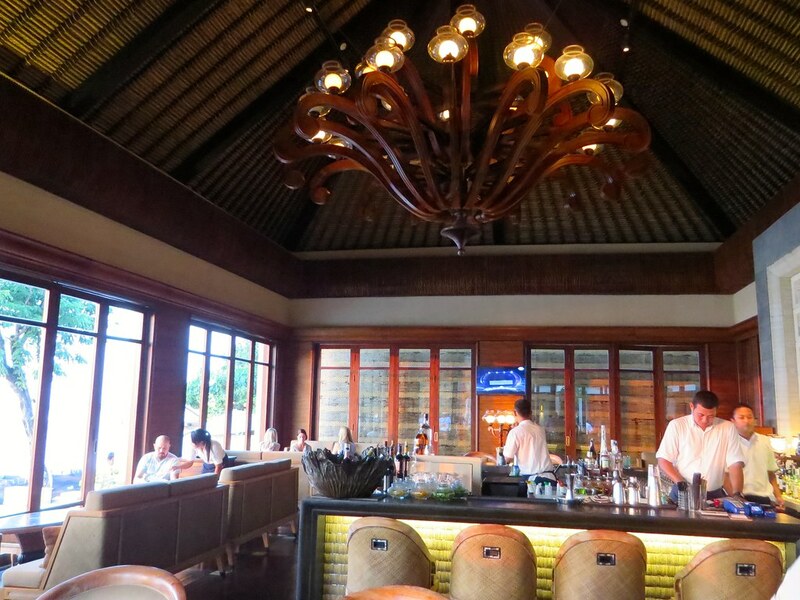 We aren't dressed for it and only have beachwear on but I'm all for spontaneity so we go to Four Seasons Resort, a five-star hotel at the end of Jimbaran Bay. 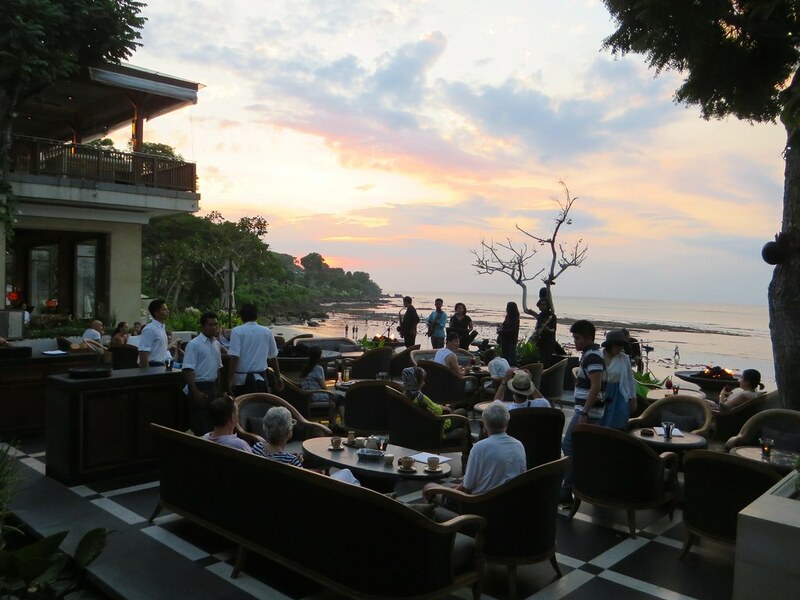 As soon as we enter, a hostess greets me and T. It is only 5:30pm and we are told that Sundara Restaurant won't open until 6 so she leads us to the bar lounge first, which offers a great view of another spectacular Bali sunset. This is where we waited until the restaurant opened. See if you can spot T! Not long after, our hostess informs us that our table is ready. She leads us to the second floor which offers a better view of the beach. 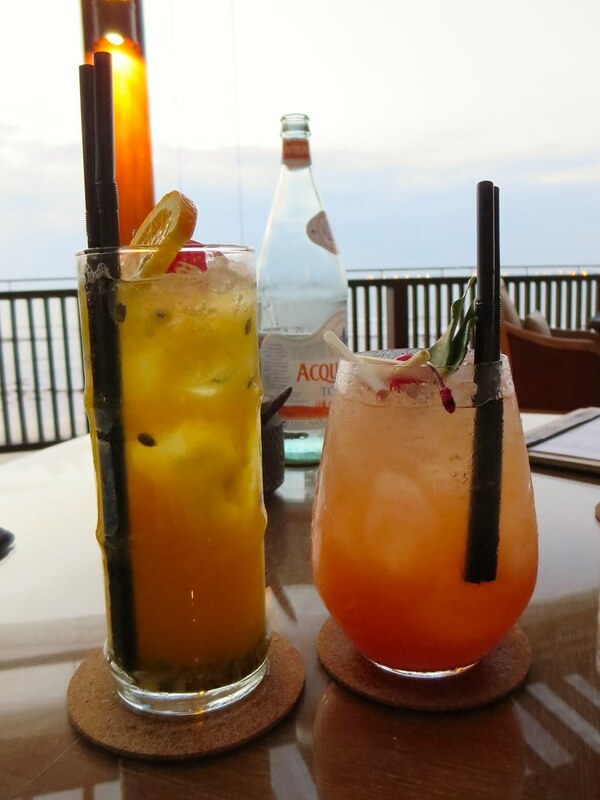 For our drinks, I order an Ipanema (IDR80,000+21%SC / $6) which has passion fruit, lime cordial and pineapple juice while T gets the Barcelona Sunset (IDR80,000++21%SC / $6) which has coriander, pineapple juice, and ginger ale. We both like our drinks. We also have Acqua Panna Still Water (IDR75,000+21%SC / $5.60). 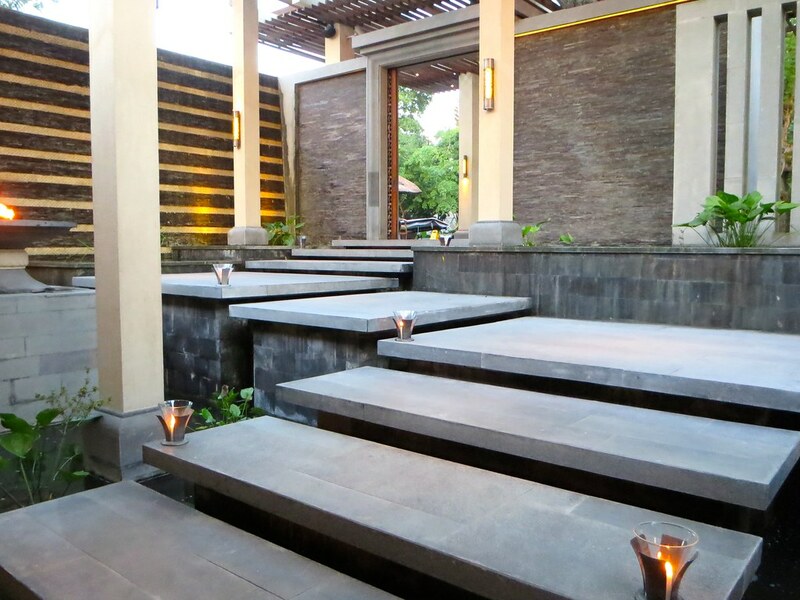 All produce served in Sundara Restaurant is local and organic and whenever possible, sourced from the Sundara's own Bedugul Farms in Central Bali. Their seafood is also locally caught. 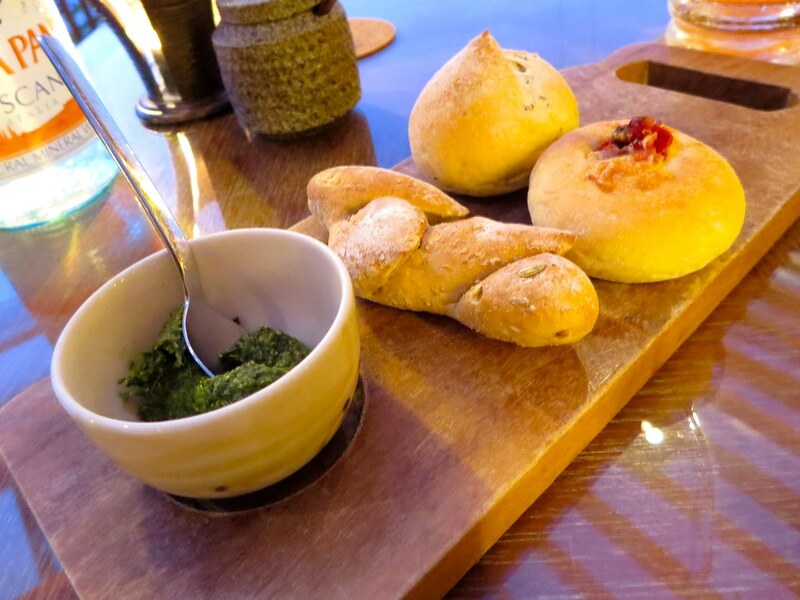 Their bread, condiments, and sauces are all made in house. 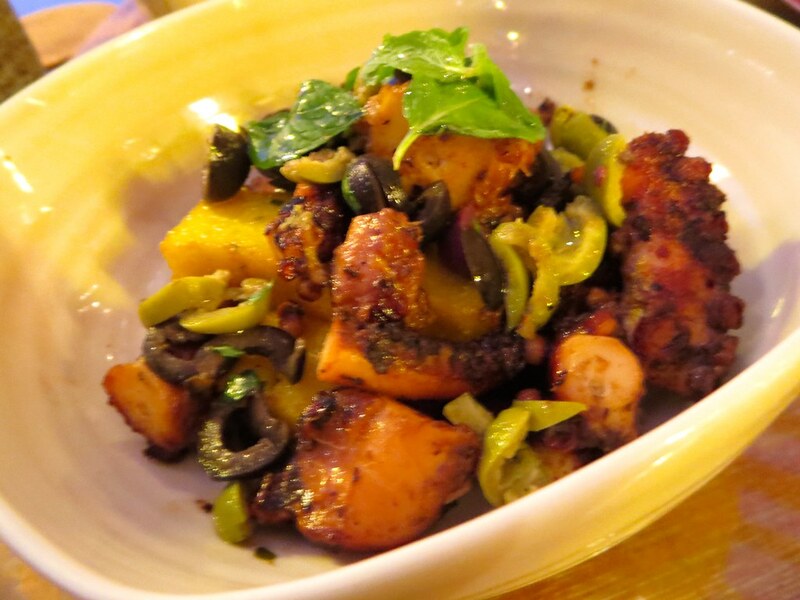 For our starter, I choose the Grilled Octopus Salad (IDR170,000+21%SC / $13) which has polenta, chimichurri, toasted green olives, and parsley. I love this so much that I almost finish the whole plate! T probably just got a bite or two. The octopus is so soft and not chewy or rubbery. The toasted olives gives the dish a salty kick. There are a number of spices and flavors present in the dish but the polenta balances all of them. Perfect. I know I will be craving for this in the days to come. 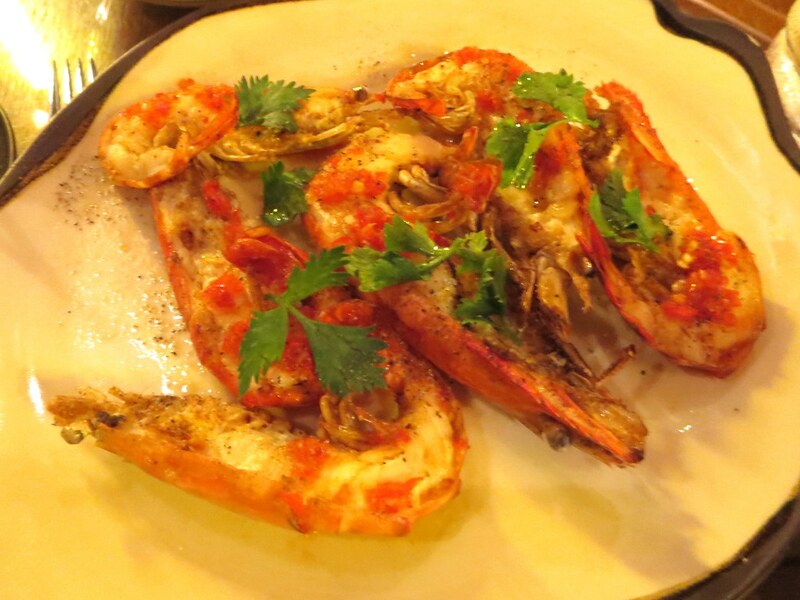 For my main, I choose the Grilled King Prawns (IDR370,000+21%SC / $28) with spicy chili sauce and celery leaf. 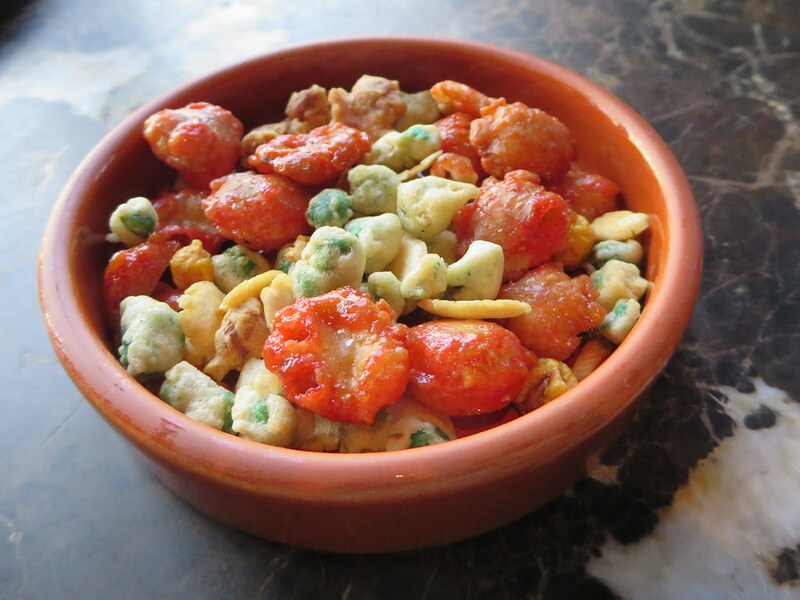 When I order prawns in high end restaurants, I usually end up ordering another dish because the prawns are too small. But in Sundara, the prawns are huge! I had to take a break before finishing the whole thing. 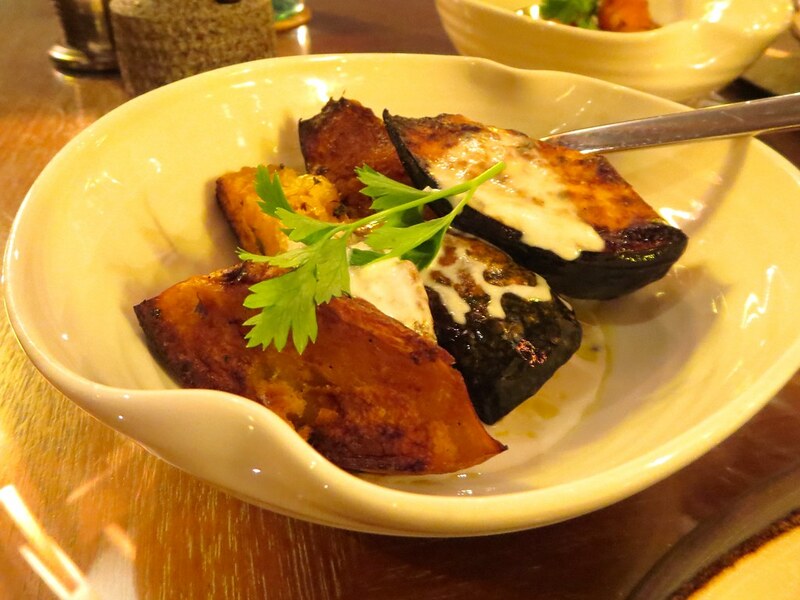 For my side, I order Roasted Pumpkin (IDR50,000+21%SC / $3.75) with garlic and parsley. This may be only be a side but it's so good. And the serving is big too! 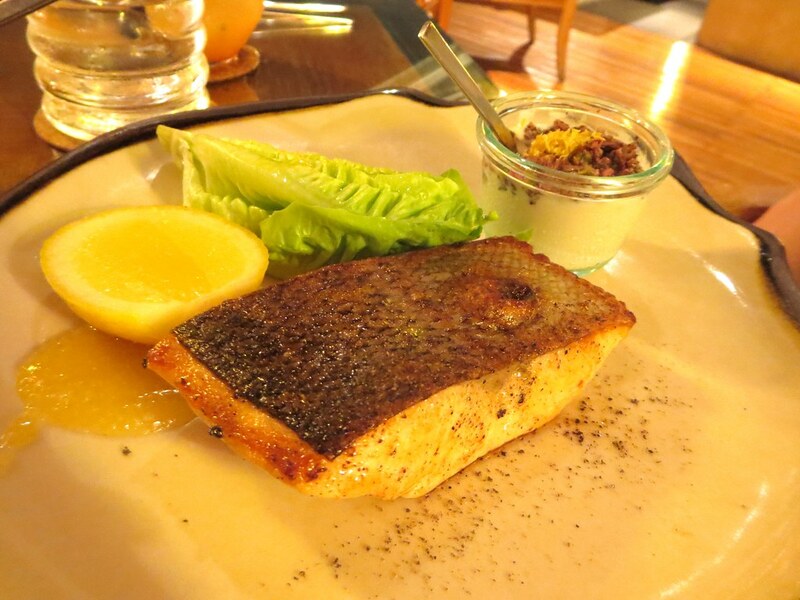 For his main, T orders the Salmon Fillet (IDR235,000+21%SC / $18) with Tahini yogurt sauce, lemon, walnuts. T loves this dish, especially the sauce. 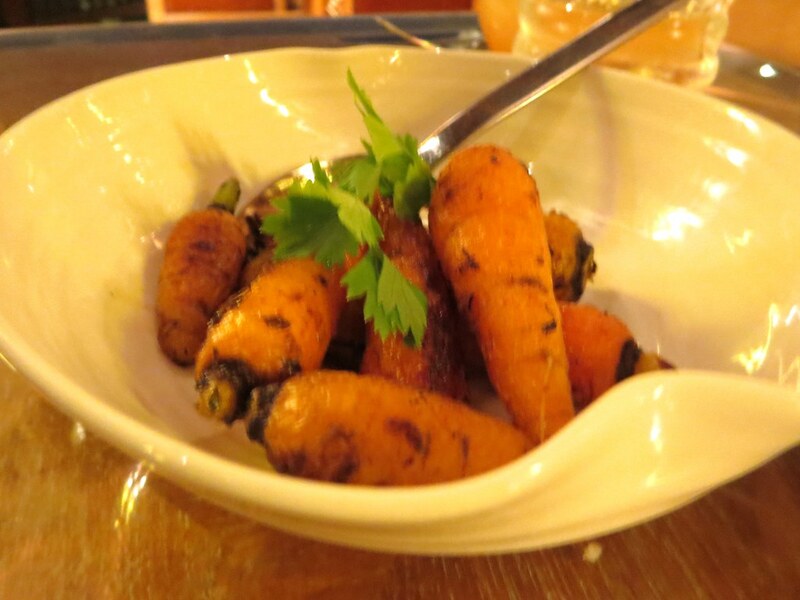 For his side, T gets the Sweet Carrots with Lemon-Thyme (50,000+21%SC / $3.75). 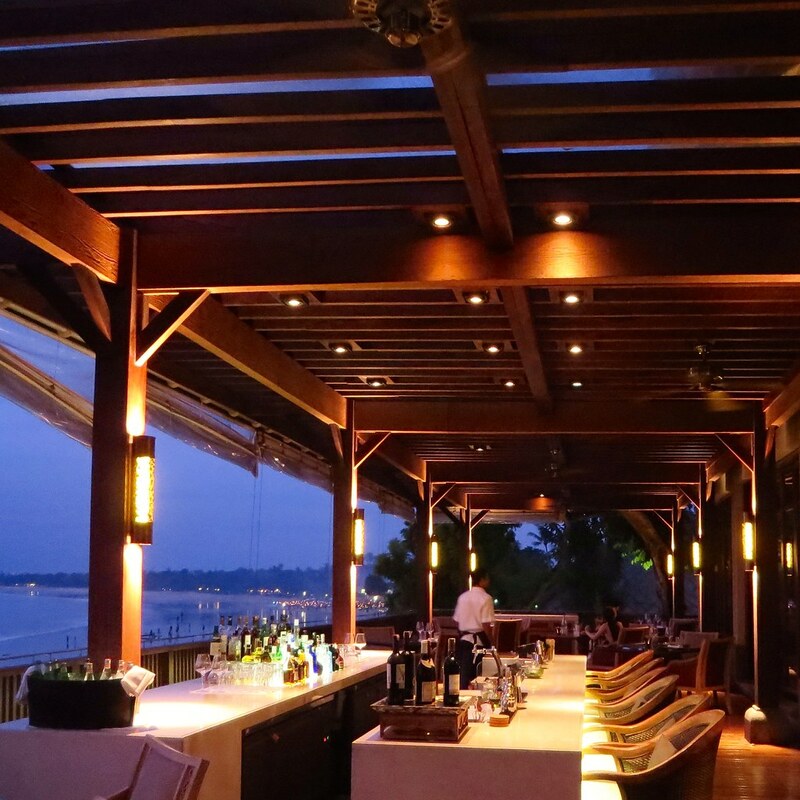 Offers a beautiful view of Jimbaran Bay. 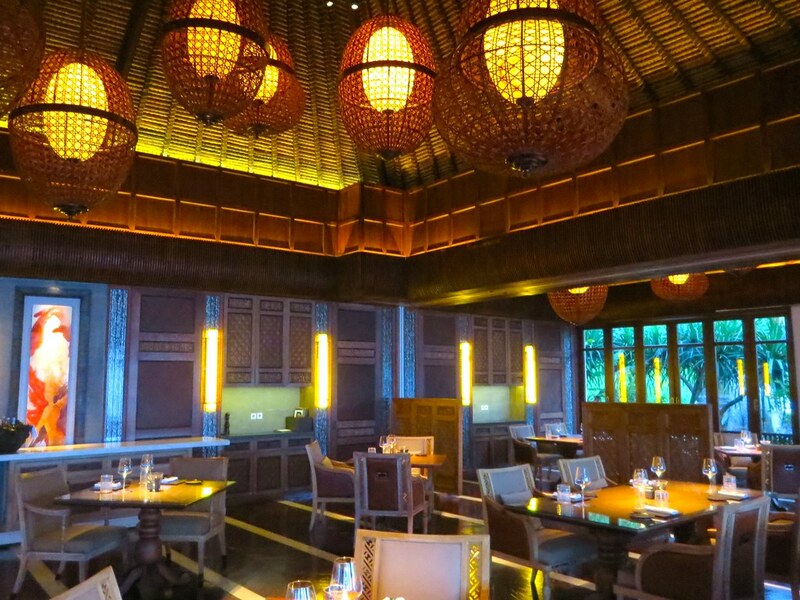 T and I loved our dining experience in Sundara Restaurant. The food is really good and everyone is warm and friendly. We will definitely be back!